Leaving the Spirit World on a trail that leads halfway back to the 1st Movement, ending in the Band Cabin at Woss Lake, in a “here-and-now” situation, with Wa singing and the wind in the trees.. I hear a faint broadband noise, not static but gently varying in volume, centre frequency and Zwicker’s parameters. At first there are only short blows that enter my consciousness, but as I regain awareness, it becomes a constant, swooshing sound, that, as I realise after a moment of malorientation, arrives at my ears mainly from the half-open window of my room at the Alert Bay Lodge facing the forest behind it. It’s still dark, so I keep lying and listening. The ocean waves manage to escape the masking grip of the wind in the trees. I can hear them very well now; although their frequency band is not that different from the wind, the internal structure of the waveform allows my brain to separate them from one another. I rub the fatigue out of my eyes, slip into my clothes, grab my gear, and head for the opening in the middle of the forest of Cormorant Island Ecological Park. The spirits of the skies are with me tonight, I think, as the wind stops to blow and leaves nothing but silence. I had been up here late in the evening, and had made a good quarter of an hour of nice ambience recordings, the dominant sound had been wind, but for the morning atmo I prefer a low noisefloor to be able to capture the awaking bugs and birds. With the whole island still asleep the dying wind leaves me in peaceful quiet. 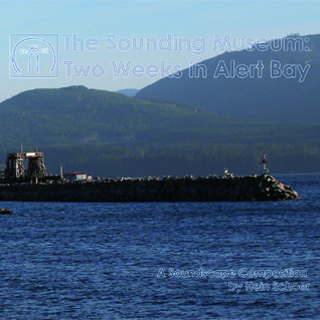 I have come to Alert Bay, BC (British Columbia) in the course of my research project “The Sounding Museum”, within which I look at (and listen to) the production and presentation of cultural soundscapes. This 42-minute piece tries to draw a picture of the contemporary sonic landscape of the people of Alert Bay, the four movements laid out below representing the sacred number and the four realms of Kwakwaka’wakw mythology. It is composed from recordings made in and around Alert Bay in collaboration with William Wasden jr. and other Native scholars of traditional culture, ritual, and mythology, roughly oriented on the tales about the raven and creator entity U’melth and other West Coast myths. It circles around the inner conflict of modern and traditional life in contemporary Native communities. Two shorter edits, that are on display in quadraphonic surround sound in the Sound Chamber at the North America Native Museum (NONAM) in Zurich, accompany the full version on this CD. The Project “Sound Chamber – Acoustic Worlds of the Indigenous Peoples of North America” has been approved by the Swiss UNESCO Commission as a contribution to the International Year for the Rapprochement of Cultures. Its scientific/artistic implementation is conducted by The Sounding Museum. I never know quite what to make of sound recordings like this one as I always feel I’m only getting half of what soundscape musician Hein Schoer experienced: something like this document needs to be visual and to be seen along with the soundtrack. For me, this project would have been much better done as a combined DVD / CD package so that I can actually see the Alert Bay, Vancouver Island, environment where Schoer did his research. Looking at the photographs of the bay, the forests that border it and the Rocky Mountains in the distant background, shrouded in white cloud, I am sure this landscape and the misty weather are as much a part of the culture of the ‘Namgis Nation that inhabits this part of western Canada; one imagines that the weather here is always cool, the air always feeling slightly damp or humid and that when one looks across the bay and sees the silhouettes of dark fir forests and the mountains rising behind them, their edges always look slightly soft and blurred and the overall mood of the area seems meditative and restful. 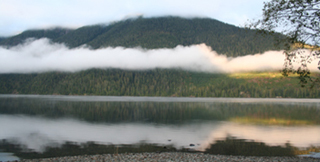 The tracks on offer here consist of field recordings of the natural sounds and wildlife of the Alert Bay area and of the activities of the ‘Namgis people. There are recordings of people performing traditional rituals and playing music, of children learning their culture’s traditional songs and their native language, and of men making traditional tools and handicrafts while the radio plays in the background. All very well but the listener has to take these recordings at face value and assume they are what Schoer says they are. There’s nothing or no-one on these recordings who gives a commentary on what parts of the soundtrack are about whatever the people are doing. If only the CD had fallen into my lap and not any other material, and I were to play the CD as is, I’d have no idea from hearing the CD which part of North America and which First Nations group were being featured. There is not even a map of the area of Vancouver Island where Alert Bay is located and no information in the package about the culture of the ‘Namgis people and how it relates to other traditional cultures of western British Columbia. Having some knowledge of traditional culture areas of North America, I realise the ‘Namgis people would have been part of the Northwest Coast cultural complex in which salmon is one of the staple foods, a sedentary life-style is normal with people living in permanent wooden houses and organised in clans, and social hierarchies dominated society with the custom of potlatches to underline social status. In the area where the ‘Namgis people live, whaling would have been part of the culture. Most people outside Canada are not so lucky to know all this and would feel quite distant from the soundtrack here, not having any idea of what it all relates to. The music is quite powerful and very rhythmic: most of the singing is done by men although there are a few occasions where children sing similar-sounding songs. There is no singing done by women but that may be because Schoer, not familiar with the culture of the ‘Namgis, did not know there might be some aspects of the culture out of bounds to him as a male; nearly every culture has some knowledge and traditions that are particular only to men, and other knowledge and traditions that only women are allowed to know. Certainly there is some solo singing here that imitates the sounds of animals and it could be this is shamanic singing, the singer attempting to contact an animal spirit for help or to gain power over some part of nature. Natural sounds include the sounds of ocean waves, trickling water and a waterfall, and there are also sounds of birds, bears, seals perhaps and howling wolves. The CD booklet includes photographs of nature, illustrations of everyday life for the ‘Namgis people and a retelling of a creation myth in which a trickster figure called Raven steals the sun. The myth may have some meaning for Schoer who like Raven “steals” a little bit of an unknown culture to illuminate a path for listeners who may be inspired to investigate further the culture of the ‘Namgis and other First Nations people in western Canada. A sprawling landscape of the world in one small town, where the curiosity of the artist and the reflexive objectivity of the ethnologist combine to express our common need to tell and retell stories. Hein Schoer´s two weeks collecting sounds have been arranged into an impressionistic narrative based upon versions of the local legend of the raven who stole the sun. Alert Bay is a tiny island community off the southern coast of British Columbia, its five hundred-odd inhabitants equally divided between Caucasian and First Nations Canadians. Schoer made over thirty-five hours of crystal-clear recordings of all the sounds you can imagine a woodland community and its surroundings might make and whittled them down to a vivid audio portrait. We hear much outdoor work but also a lot of indoor learning and a lot of play. The feature presentation is forty-two minutes long and entitled ”One Day in the Life of Raven”. It is followed by a workshopped version exactly half as long, and an exhilarating six-and-a-half minute ”radio edit”, which I suppose is a kind of public radio hit-single version. The album package is generously designed, richly illustrated and packed with both tales and details by written by Schoer. Massimiliano Busti | BLOW UP. Работа Хейна Шоера под названием «The Sounding Museum: Two Weeks in Alert Bay» была выпущена при поддержке, ни много, ни мало, «Юнеско» в рамках проекта «Sound Chamber – Acoustic Worlds of the Indigenous Peoples of North America». Видимо, отсюда и весьма представительное издание – лакированный digipack и многостраничный буклет с фотографиями, в котором сам автор рассказывает о своих странствиях по Северной Америке и Канаде, где, в частности, и родился на свет этот альбом. Путешествуя, Хейн ведет своеобразный путевой дневник, добавляя в него не строки с заметками или фотографии, а звуки, записанные в течение дня, чтобы потом, в спокойной студийной обстановке, прослушать их еще раз, выбрать наиболее интересные моменты и объединить их в звуковые пейзажи. Сорокаминутная композиция «One Day in the Life of Raven», разделенная на несколько глав – рассказ от «лица» обычного ворона (с его карканья, нарушившего безмятежную тишину, история и начинается) не столько об окружающем мире, сколько о людях, населяющих городок около той самой бухты Элерт. Коренные обитатели этих мест, индейцы, устраивают свои гипнотические, экспрессивные ритуалы, танцевально-вокальный перфоманс под бой барабанов и бубнов, туристы переговариваются на разных языках, расспрашивают местных зрителей, гуляют по улочкам и заглядывают в магазины, лавочки и мастерские, откуда доносятся голоса рабочих, телефонные звонки и песни Рода Стюарта из радиоприемника. Пролетая над городом, ворон слышит не только это, но и многое другое – окружающий мир в целом, наполненный гулом океана, птичьими криками, шумом проезжающих машин, и прочими звуками, подобранными так удачно, что создается эффект присутствия, ощущение действительно рассказанной истории, простой, повседневной, но связавшей вместе множество людей, ставшими участниками действия под названием «жизнь». «Four Worlds» представляет собой укороченную в два раза, и, скажем так, более концентрированную версию первой композиции (использованы те же записи, что и в «One Day in the Life of Raven»), акцентируя внимания именно на выступлении индейского ансамбля и на рассуждениях об этом действе местных обитателей. «Short Trip» – тот же ритуал, перенесенный из зала культурного центра на лоно природы, куда-то поближе к водопаду. Кстати, обе эти композиции были созданы для инсталляции в одном из музеев, и демонстрируют возможности объемного звука, так что уровень записи очень высок, детализация максимальна, а структура повествования полностью захватывает воображение. Шоеру удалось создать одну из самых выразительных работ в жанрах «soundscapes» и «field recordings» за последнее время, показав себя замечательным рассказчиком и почти что гениальным звукорежиссером. The German Gruenrekorder label explores phonography in many forms, extending their activities beyond their substantial catalogue of CDs into publications, events and lectures held on the subject of field recording, natural acoustic phenomena and the links with experimental music. These two recent releases, while both involving field recordings to some degree, illustrate the wide range of activity undertaken by the label. Hein Schoer, cultural soundscape producer and the prime mover behind the research project “The Sounding Museum,” inaugurates the CD series with a captivating meditation on the Native community of Alert Bay, British Columbia. It’s more than a sound portrait of the physical activities in play on a given day—construction work being done, children being taught, and so forth—as it also focuses on the myths (about the raven and creator entity U’melth, for instance) and ritual dances and chants that are so much an inextricable part of the West Coast community’s culture. In one sense, the work documents the people’s ongoing attempt to strike a balance between the modern and traditional in their lives. After opening with the croak of the titular bird, “One Day in the Life of Raven (Full Version)” assumes the form of a long-form travelogue through the Pacific Northwest Coast. Schoer fashions it as a work in four movements (“The Natural Soundscape,” “The Artificial Soundscape,” “The Human Soundscape,” “The Cultural Soundscape & Spirit World”) that begins with arrival at the site, followed by sound samplings of the natural landscape (rushing waters, wind, woodpeckers, drizzle, fire) and those made by residents of the locale (drum chants, conversations, an elementary class in session) heard against a backdrop of radio music (a Rod Stewart cover of “Street Fighting Man”) and construction noise (hammering, drilling, fishing). “The Spirit World movement,” not surprisingly, turns out to be the most arresting section due to the ritual chants and calls that emerge, but the piece as a whole—especially when it never stays in one place for long—holds one’s attention throughout the trip. Despite its forty-two-minute length, the piece comes across as a captivating sound portrait of a vibrant community with deep roots in spirit culture and story-telling and connections to the landscape. Two shorter edits accompany the CD’s primary work. “Four Worlds (Workshop Edit)” re-assembles the original’s elements into a half-sized version that feels comparatively more fragmented and experimental, the focus less on coherent narrative and more on collage-like design. Overlapping conversations emerge amidst car noises, bird caws, radio tunes, fireplace crackle, phone rings, drilling and wood hammering, and chants. Predictably, the six-minute “Short Trip (Walk-In Edit)” offers a mere snapshot of the original, though it does convey the character of the original at a micro-level. In essence, the edits are purely supplementary to the full version. The release comes with a booklet whose text (written by Schoer) provides detailed background about the project as well as documentation about the sound sources used in the recording. Enhancing our understanding of what is heard during the work, the text identifies the various locales that are visited, such as the U’mista Cultural Centre, where a language class, dance performance, and Raven Song rehearsal take place, and the T’lisalagi’lakw Native School, where a fourth/fifth grade science class is heard in session. The project as a whole succeeds in allowing the listener previously unfamiliar with the site to feel as if he/she has come to be more enlightened about its character and spirit following the immersive experiences of listening to the work and absorbing the booklet’s text. Field recordings at work here. Presented in a glossy digipack and extensive, full color booklet. No doubt no money was spared by those who hand out grants. Or perhaps the tourist office of Alert Bay in British Columbia where one Hein Schoer recorded thirty-five hours of music in 2009. An area which I never visited. I was listening to this work, which has a ‚full version‘, a ‚workshop edit‘ and a ‚walk-in edit‘, and thinking about the whole notion of field recordings and works like this. Works like this stay a bit alien to me. I hear all the usual sounds (water, rain, children singing, sounds of human activity, cars), and marvel about the beauty of the recording, and perhaps also the narrative aspect of it, it also stays a bit too distant for me. Partly because its not easy to relate to a place I don’t know myself, and perhaps also because it seems a bit ‚easy‘, dare I say it? You throw a whole bunch of field recordings together and that’s your piece – I am overdoing it here, but I hope you get my drift? I find it hard to see the whole point of this exercise and maybe that’s a problem I have with a lot of other works like this. The interest grows, I guess, when you know the place. Maybe the whole field recordings thing, pur and unchanged, is something I heard well enough by now?